The question came up because of the giant post on citations I did on the Whitespark blog the other day. It’s come up before. Mike Blumenthal wrote a post on this question last year, and hit the nail on the head. “First of all, there’s nothing sneaky or below-board about listing one’s business on a directory of businesses. It’s not an attempt to “game” Google, partly because there are very tangible reasons to list your business on various IYPs: you want users of those sites to be able to find you, and you want reviewers on sites other than Google to be able to review you. As opposed to link exchanges and the like, where the links have no purpose other than to try to puff up one’s rankings. “Second, Google needs the data that’s on the most-important sites (where you can get citations). It relies on them in order to populate its results. Without them, Google’s local-business data would be incomplete at best, or – more likely – an absolute train-wreck. “Third, most businesses have citations that their owners didn’t even build: They grow naturally over time. The citations profiles of those businesses are usually indistinguishable from those of businesses for which someone has been proactively working on citations. Your thoughts? Leave a comment! Any business owner who’s tried to get visible to customers in local search has noticed the huge number and variety of citation sources out there (AKA places to list your business). We all know that people who own businesses in America are of all different stripes – some who identify as a minority, some born in other countries, some multilingual, etc. That’s one of the very best things about this country. What most local business owners and local SEOs don’t know is that there’s also a variety of local-biz directories geared toward many of the different ethnicities and identities of people who’ve built businesses here. 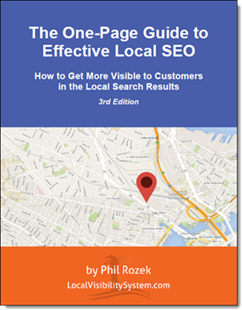 These sites are important for two reasons: Because “local” business owners (1) want to attract the “right types” of customers and (2) need to gather as many local citations as possible in order to get visible to those customers in the local search results (mostly Google+Local and Bing). I’ve rounded up a list of ethnicity-specific / identity-specific sites, some of which you may want to list your business on. I didn’t know about these sites, partly because this topic gets zero attention – even in local-SEO circles. But that doesn’t mean your customers don’t know about them and use them. Plus, chances are good Google views them as high-quality citations, which could help your local rankings. This post is for you if your services cater to people of a particular origin, or if you’re trying to find more customers who have a similar background to yours – and who might be looking for someone like you in the same way. 1. I’ve only included directories that are (a) free, (b) available to people in any city in America, and that (c) don’t require you to place a reciprocal link on your site. 2. There’s no good way to categorize the sites, so I’ve simply listed them alphabetically. Most of the site names are self-explanatory, but I’ve added little side-notes to the ones that might not be. If the list doesn’t have a directory geared toward a particular type of person, it’s either because I simply couldn’t find such a directory (possible) or because I didn’t think to look (not likely – I spend 2-3 hours combing the web). In any case, I’m sure there are some great sites out there that I missed. And I just know there must be a lot of non-US sites similar to the ones on the list (I’ve stumbled across a few so far). I’d really appreciate any suggestions. How many of the above sites apply to your business (or a client’s business)? Any thoughts on how to make the list a little better? Leave a comment! Customer reviews are crucial to your local rankings and overall success in Google Places, as you may know. You need reviews that customers write directly on your Google Places page, and you need customer reviews on third-party sites like InsiderPages, CitySearch, etc. We know that the first type of reviews—“Google reviews,” written directly on your Places page—have a strong influence on Google Places rankings. That’s well-established, and I’ve seen it to be the case throughout the 3 years I’ve been specializing in Google Local. 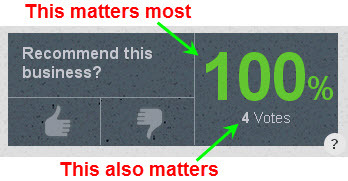 But what about reviews written on third-party sites? Yeah, they’re important. But what else do you know about third-party reviews and how they relate to your Google Places rankings? Probably not much more or less than I did before I did a little fact-finding on the topic. I took a “core sample” of 200 local markets and 1400 businesses in Google Places, in all different industries and cities in the US. Obviously this wasn’t exhaustive research—if it was, I’d be using my break from collecting data to shop around for some glass eyeballs. However, I’ve got enough figures to answer some specific questions about how third-party reviews tie into first-page Google Places rankings. First of all, there is a correspondence between the Google Places ranking of a business and how many third-party sites it has customer reviews on. Maybe you intuitively knew that already, but now you have some numbers. 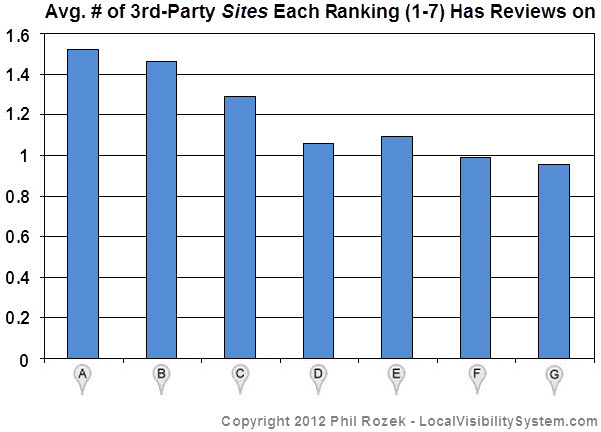 The top-3 rankings have customer reviews on more sites than rankings #4-7 do. The difference is even clearer between A-B and F-G: rankings A-B generally have reviews on 1-2 third-party sites, whereas the lower rankings tend to have reviews on just one third-party site. That’s a ratio of 3:2. Put another way, the businesses at the top of the Google Places “7-pack” typically have customer reviews on 50% more third-party sites than the businesses at the bottom of the 7-pack have. The numbers also tell us that if your business is in the top-7 of Google Places, chances are you’ve got customer reviews on at least one third-party site—meaning a medium other than Google Places or Yelp.com (because Yelp reviews no longer show up on Google Places pages). This helps affirm what I’ve told my clients for a long time, and what Mike Blumenthal has suggested for quite a while: that you can’t simply rely on the reviews that customers write on your Places page. If you’re serious about getting a top-7 Google Places ranking, one good place to start is with asking some of your customers to write you reviews on at least one third-party site (InsiderPages, SuperPages, YellowPages, CitySearch, or another). The top-2 rankings have significantly more reviews than rankings C-G (3-7). Once again, we’re seeing a difference of 50-100% between the top of the “7-pack” and the rest of it. Again, this doesn’t count Google Places reviews (which obviously aren’t “third-party”) or Yelp reviews (which Google Places no longer uses). If you’d like to get into the Google Places top-7, you should probably try to get at least 5 customer to write reviews on at least one third-party site. Or if you’re already in the local top-7 and trying to get to the very top, your strategy should include getting at least 30-100% more customer reviews on third-party sites than the other top-7 businesses have. In terms of reviews, there’s a big gap between #1 and #7. 3. There’s also a correspondence between your ranking and how many total third-party reviews you have. Ranking in the top-2 will probably require that you get 30-100% more customer reviews than your page-one local competitors have. 4. If you’re trying to get into the Google Places top-7, a good initial benchmark is to get at least 5 customer reviews on at least one third-party site (SuperPages, CitySearch, etc. By the way, you can download my spreadsheet with all the data, in case you’d like to roll up your sleeves and handle some numbers. Of course, I’d appreciate your weighing in—leave a comment! You chaps and dames in the UK may drive on the wrong side of the road and confuse beer with cocoa (only one of which should be served warm! ), but at least the challenge of getting a business visible in Google Places is the same across the pond as it is here in the States. OK, fine, so maybe even the Google Places / local-search-visibility puzzle is different in the UK from how it is here. That is, you need to list your business on different third-party sites in order to get maximum local visibility (which isn’t news to you). The first step, of course, is to know what those third-party sites are. Enough of me mates have asked me to cough up my list of UK local-search citation sources. It’s about bloody time I do so. 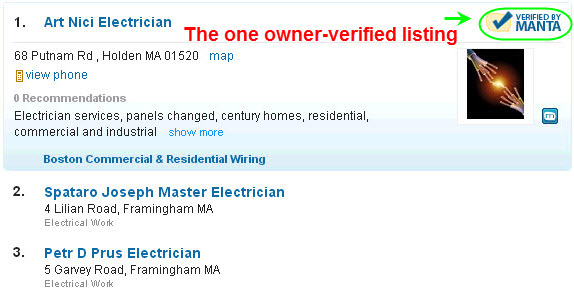 Now comes the fun part: listing your business on all the above sites. As I’m sure you’ve noticed, links to the “Add business” pages are on the right, so at least you don’t have to hunt around for them. I’ve added all of the sites to my Definitive List of Local Search Citations as well—where they mingle with their Yank counterparts. Last but not least, credit goes to David Mihm for listing a number of these sites in a great blog post he did a few years ago on top UK citation sources. I’m sure I’ve missed quite a few, so please leave a comment if you have any sites to suggest. You already know citation-gathering is crucial to your local ranking in Google Places, and you know at least the basics of how to get citations for your business. That’s not the problem. The problem is that getting dozens of citations is about as enjoyable as getting a colonoscopy. You want it to be over with as quickly as possible, so that you can get back to running your business and enjoying life. 1. Keep a master spreadsheet that contains all your login info for every third-party site you list your business on. It should contain all your usernames, your passwords, the email addresses that you used to sign up with the various sites, and any other info that you may need to log in with like (“secret answers”). I like to use Excel for this. The spreadsheet won’t take long to create, but it will save you from a world of pain if you have to log in and change your business info on these sites, change your passwords, or forget your passwords. Obviously, you can organize the info in the spreadsheet however you’d like. It doesn’t need to be pretty. But if it helps, here’s an example of the type of spreadsheet I’ve used. 2. Have a “status” and a “next step” column in your spreadsheet. Sometimes it’s hard to keep track of where your listing stands on each site and what you have left to do in terms of getting your business listed, verified, etc. In cases where you’re not able to get your listing completely squared away at once, jot down whether your listing is actually up on a given site, and (if it’s not) any next steps you’ll have to take in order to get your business listed. 3. Include your business name, address, and phone number in the spreadsheet. Having your “NAP” easily accessible in the spreadsheet helps you in two ways. First, all you have to do is copy and paste the info into any fields that you have to fill out. Second, you avoid typos because you’re not having to type. 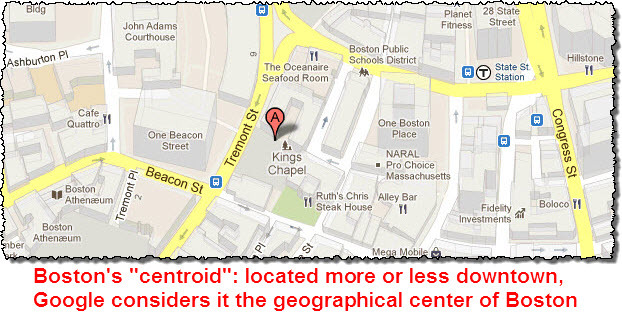 Use the same formatting that you see on your Google Places page. 4. Have a document that contains a long description and a short description of your business. Some sites only give you a tiny blurb with which to describe your business or services, and others insist that you give them a bigger and beefier description. I’ve found that one description should be 150 characters long (including spaces), and the other should be at least 300 characters long. Because most sites ask you for a description, you’ll save time by having yours handy, rather than having to retype anything or hunt around for a version that you’ve already listed on another site. 5. Have Google Autofill installed on your browser toolbar (if it’s not already). It can save you time and typing. Of course, you’ll still want to double-check all the fields to make sure everything’s been filled in correctly. By the way, if you’re really on top of your game, you’ll add these login/submit pages to your spreadsheet. 7. 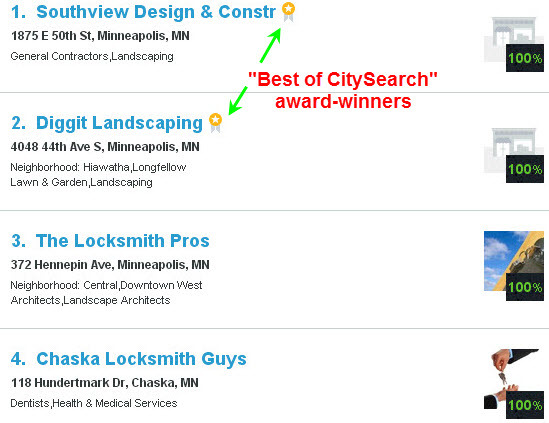 Double-check your info religiously, right after you initially submit/complete each business listing. Ideally, log out and log back into your profile on each site, to make sure all your info is there and that it’s all correct. Do this ASAP, so that no incorrect info can spread to other sites (which often share data with each other). 8. Keep any photos you’ll be uploading in an easy-to-find subdirectory on your computer, like Desktop. Pretty much every site will have a “Browse” button that you’ll need to click on and use to navigate to the area of your computer where you store the pictures of your business. It’s faster to upload your pictures you don’t have to rummage through half a dozen nested folders or subdirectory just to find them. 9. Personal suggestion: don’t try to do all the citations one sitting. It’s easier to mess them up, and it’s even easier to get totally sick of citation-building and slow down to a crawl. You can take your time: it takes weeks for your business info to get processed on each site and to result in citations that give your business a boost in Google Places. I also suggest you use the Local Citation Finder to help find citations. Obviously, I’ve been talking about how to save time on whatever citations you know you’re going to collect, and finding citation sources in the first place is a whole separate subject. I’ll probably do a separate blog post on the best citation-hunting techniques. Still, the Local Citation Finder can save you a ton time and hassle, so it belongs on this list. Got any personal tricks for easier / quicker / more pain-free local citations? Leave a comment!